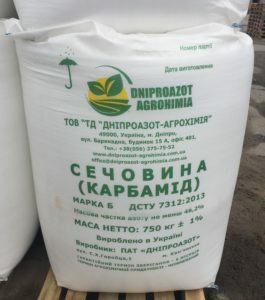 Carbamide is the most concentrated nitrogen fertilizer applied to all types of soils, as the main fertilizer before planting and for fertilizing agricultural crops. Among the nitrogen fertilizers, urea is the most suitable for foliar application – it does not cause burns that occur on the surface of the leaves when sprayed with aqueous solutions of ammonium nitrate. When applying carbamide, metal parts of the sprayers are not subject to corrosion. This is due to the fact that the aqueous solutions of urea have a neutral reaction, and in this fertilizer there is no free ammonia. The advantage is that organic carbamide molecules penetrate into plant cells 10-20 times faster than cations and anions of mineral salts. The high rate of penetration of urea into the cytoplasm of cells is due to the presence of the most accessible form of nitrogen in it – amidic, quickly and easily passes through biological membranes. Also, urea, as an organic substance, is faster than inorganic nitric salts, enters into tissues in interaction with other substances and is intensively used by the plant in biochemical processes. Plants absorb it not only after the previous decomposition with the formation of ammonia under the action of the enzyme urease, but also with the direct inclusion in the cycle of conversion of nitrogenous substances. 2) substance of the cell. Ammonium and nitrate forms of nitrogen, on the contrary, before they are used by plants in synthetic processes, undergo a number of chemical transformations.